Can We Get Enough Nutrients Through Diet Alone? 3 eggs, over easy on a bed of spinach with cayenne pepper and salt, sautéed in 1 tbsp coconut oil. 2 cups of coffee with about 1/2 cup whole milk and 2 tsp honey total. I chose just a few vitamins to follow because tracking everything would make my brain explode. One thing to keep in mind, I’m calculating this from information I found on the internet. This does not take into consideration farming methods, organic/nonorganic, how old the produce is, how it’s prepared and what not. All of those factors contribute to the overall nutrient value of a food. For instance, I can’t find information on fermented organic cauliflower. It’s not exactly a popular food item. Fermenting does alter the nutrient content of foods. It increases B vitamins and it decreases the vitamin C content (it changes from ascorbic acid into ascorbigen and anticancer nutrient so not a bad thing). I overcooked my salmon on accident. My spinach was sauted, not raw, and was at least a week old. My carrots are about a month old and boiled though the water soluble vitamins just became part of the soup. Lots of factors. Ooh and my eggs are from my pastured hens who I think have a rockin’ diet of grasshoppers and ticks. Their nutrient amount may vary significantly from the industry standard pastured egg. Also, most charts I looked at didn’t differentiate between vitamin A and beta carotene. There is a difference people! Did you know infants cannot do the conversion and children do it poorly? There are also many factors that can prevent adults from making the conversion too like diabetes and celiac disease. I’m wheat intolerant so I might be one of those who doesn’t make the conversion well. The value I’m using is the Recommended Daily Value, %DV. It’s what you see on the back of a package in the box. There is lots of debate about whether the %DV is adequate to keep a person healthy or if it’s just barely enough to keep us from being sick. Is it optimal? In the case of vitamin D in particular, the recommended amount I think falls far short for optimal health. Do I want to take just enough vitamin C to prevent scurvy? Ok, all that to say the following is just a guess. A shot in the dark. But a good enough guess to let me know where I need to be more careful and good enough to let me pat myself on the back for being awesome. You can see I rock in many areas but fall short in a few too many. Vitamin E is only 37%. Eek! My iron is short but your body stores iron and I know I’ll be eating liver later in the week. Some of the B vitamins and I fall a little short on but my ferments might put me at an ok level with their extra B boosts. Calcium is a little low today but that’ll be made up quickly when my fridge is restocked with fresh milk, cream and cheese on Monday. So all in all, the only ones I’m really concerned about is vitamin E and magnesium. My most recent blood test showed my magnesium was low, not out of the boundries of normal just on the low end. I do use a magnesium oil spray regularly now. I can easily remedy the other by eating sunflower seeds and almonds (which actually are a regular part of my diet just not today). I also do take fermented cod liver oil and butter oil daily but I did not include those two whole food supplements in my little analysis. Ok, so do I need an extra supplement to meet the minimum daily requirement? Or would my diet be adequate enough if I were a little more mindful? And if I, someone who doesn’t eat a standard American diet falls short, what does the rest of the population look like? This little experiment was a lot of work. Looking up every single thing I ate for just one day and multiplying or dividing to get the right portion size, oy! I’m glad I did it though. Knowledge is power. 5 comments to Can We Get Enough Nutrients Through Diet Alone? I don’t think I could do it everyday! I’m so glad I did this one day at least. It’s encouraging to see I do pretty good. 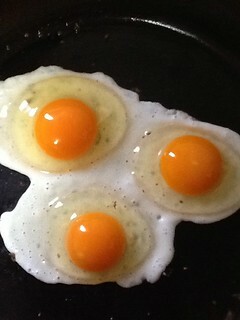 Pastured eggs are higher in E than store-bought. So I’d bet your numbers are higher. http://www.motherearthnews.com/Real-Food/2005-08-01/Free-Range-Eggs.aspx says they have double the Vitamin E as a store-bought egg. Oops, I forgot to link to that article. Those are the numbers I used. It’s interesting how numbers can vary so much from one pastured egg to the next.